The perfect location for your next beach vacation! 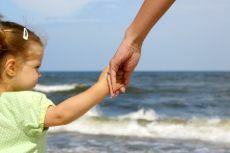 Whether you've been vacationing on the Outer Banks of North Carolina since you were a child, or this is your first trip to our beaches, you're sure to find some helpful information in the section. All you need to know about the Outer Banks is here - everything from town info, to attractions, to restaurants, to shopping, to weather! Click on the links below for detailed information on each topic. You'll find beautiful beaches and friendly faces throughout the Outer Banks, however, each individual town offers a unique vacation experience. We provide information on the beaches, activities, attractions, and restaurants found in Carova/4x4 Beaches, Corolla, Duck, Kitty Hawk, Southern Shores, Kill Devil Hills, Nags Head, South Nags Head, Roanoke Island and Hatteras Island. Beaches are always the top priority on the Outer Banks, but there are countless other things to do! 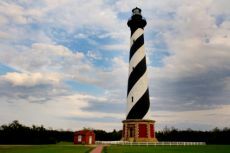 Learn about famous Outer Banks landmarks such as the Wright Brothers Memorial and the Cape Hatteras Lighthouse, read information on Outer Banks activities such as fishing and water sports, and find out where to do some fantastic shopping! One of the great things about the Outer Banks is that you can chow down on some good ol' North Carolina BBQ one night, treat yourself to a fine dining experience, then grub out on locally caught and prepared seafood the next! 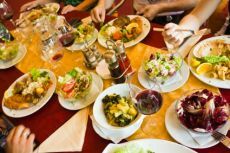 We've provided an interactive Google Map with some of Sun Realty's favorite Outer Banks restaurants. Enjoy! 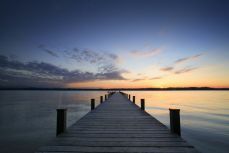 We provide you with all the basics about vacationing on the Outer Banks. Learn about Outer Banks beaches, ocean and pool safety, driving directions, as well as area history. Read tips on how to have fun on a budget, and learn how you can help protect the natural beauty of the Outer Banks. We also provide an Outer Banks weather page with current conditions, forecast, tide chart, and radar. Why Vacation on the Outer Banks of North Carolina? The Outer Banks is a year-round vacation destination! Sun Realty gives you our Top 10 Reasons to Visit the OBX in spring, summer, fall and winter. Find out which season Outer Banks locals actually like the best and why. Also, learn why thousands of vacationers are coming to the Outer Banks in late November (here's a hint - it beats staying at grandma's).